What has happened to Ronaldinho? When Barcelona walk out against Manchester United on Tuesday there will be one player conspicuous by his absence - Ronaldinho. The Catalan side are locked at 0-0 and would have been a different proposition going into the second leg of the Champions League semi-final with a fit Ronaldinho in their ranks. But he is injured, boss Frank Rijkaard said this week he expected the Brazilian to exit the Nou Camp at the end of the season and there is more than a hint of mystery surrounding how an apparently perfect club/player marriage has come apart at the seams. Ronaldinho has hardly figured for Barcelona during a campaign which has clearly seen as rapid a disintegration in the relationship between the Spanish giants and their former golden boy as the speed of the Brazilian's fall from grace. The brilliant playmaker - still only 28 - has been accused of poor form, lacking fitness and focus, and a fondness for the high life. BBC Sport charts his slide. 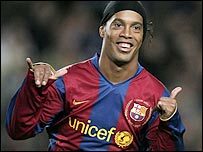 Ronaldinho joined Barcelona in July 2003 when they were stumbling giants and he was the pivotal figure in rejuvenating their flagging fortunes. His blend of devastatingly incisive play and stunning tricks inspired Barcelona to the La Liga title in 2005, their first since 1999. His magic then helped them to a La Liga and Champions League double in 2006 and, that summer, his encore was supposed to come at the World Cup in Germany where the platform seemed set for him to elevate further his already iconic status. Instead, he and Brazil flopped and he has since been a shadow of the player who lit up world football for a few short years early this decade. Ronaldinho was the Fifa World Player of the Year for 2004 and 2005 but was third in the race for the award in 2006 and a distant fifth in 2007. He was also voted the European Footballer of the Year for 2005. But he has failed to make the top three of that award for the past two seasons, during which his decline has been remarkable. Already under fire for his poor form, Ronaldinho was pictured last season with his shirt off at the end of a game looking anything but the lean athlete he was supposed to be. On the international front, he was briefly stripped of the symbolic number 10 jersey of Brazil and was a Barcelona substitute for the first time when fully fit for the 1-1 draw at Espanyol on 1 December, 2007. He briefly returned with a flash of brilliance - an overhead kick in a 4-2 defeat at Atletico Madrid in March - before fading back into ignominy with doubts cast over the injury which apparently ruled him out. "It is astonishing," says Spanish newspaper El Pais writer John Carlin, "as his has been an almost overnight fall. "It is an incredible shame. He was poised to become one of the all-time greats two years ago. But he failed to live up to expectations at the 2006 World Cup." It appears Ronaldinho has been responsible for his own downfall, with his attitude, mentality and lifestyle all coming under fire. The contrast between the fun-loving Brazilian way of life and the discipline needed to stay at the top looks to have become too difficult a line to tread. "There is intense disappointment all round, whether it be the fans, media or the [Barcelona] board, with the way in which he has handled the decline in his own physical prowess," says Spanish football expert Graham Hunter. "He hasn't been particularly grown up in the way he has handled a low in his career. "He will feel he should have handled it with a great deal more professionalism, enthusiasm and should have been more durable." His penchant for Barcelona's nightlife has been at the centre of the breakdown in both his form and his relationship with his club. That split burst out into the open recently when Ronaldinho said he was not playing because he was injured only for Barcelona to fail to back up his claim. "Let's be factual," said Hunter. "Both he and [team-mate] Deco have publicly defended their right to go out at night. "Their point is it's up to them about how professional they are about what they do when they go out. It's not a question about nightlife or if they go out because they do. "I think where they have fallen down is they have not handled well when they chose to go out, how long they are out for and what they do when they are out. "Therefore, you do not need to take my opinion, you need to take the word of Ronaldinho defending his right to go out at night. "And, while there is fault on both sides - as there is absolutely without question in my mind that certain people within the football club have been briefing against him to the media - he has given them ammunition to do that. "Right now he is definitely injured. He pulled a groin during training and again, it is a matter of fact, that prior to that there was a dispute between the player and club about whether he was or was not injured." Despite the rumours swirling around Ronaldinho's future, Barcelona president Joan Laporta insisted during the January transfer window that the player was not for sale. "We are not going to sell Ronaldinho," Laporta said. "We are not in contact with Chelsea, AC Milan or any other team. We are counting on Ronaldinho." But the player has failed to rise from his stupor and Carlin believes any similar sentiments from the Nou Camp hierarchy would now be laughed off. And Hunter and Carlin both agree the deterioration in the relationship between club and player signals an inevitable parting of the ways. "The relationship between Barcelona and Ronaldinho is terminal," said Carlin. "There are always surprises in football but one can be as sure as one can that it is over." The fans also seem to have had enough of Ronaldinho's antics and, while the some players might want him to stay, they are unlikely to get their wish. Argentine Lionel Messi is the heir apparent to Ronaldinho's Nou Camp throne and he said recently: "At Barca, we want everyone to remain at the club. If he goes, I will be sad. "He has helped me a lot to integrate into the team. Any team would like to have him. I still hope that he will stay." 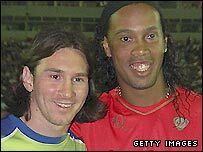 Messi, though, may have unknowingly been a component in Barcelona's willingness to let Ronaldinho leave. The club is said to want to ensure their new prize asset does not go down the same path as his fellow South American. "The feeling is that he is not good for Messi," said Carlin. There is little question no other player in the world is capable of touching the heights to which Ronaldinho soared before his struggles began. Can Ronaldinho rediscover that famous smile? His dazzling skills even earned him the applause from some fans of Barcelona's bitter rivals Real Madrid when he inspired the Catalans to a 3-1 win at the Bernabeu in November 2005. The hope is that a new club and challenge will again ignite his fire and he can find it within himself to reach former heights, with the ball firmly in his court over his future. "He has to go somewhere but I get the feeling he will remain a shadow of himself," said Carlin. "At a big club like AC Milan he may rediscover his appetite." AC Milan are in talks with Barcelona about signing Ronaldinho but the asking price is proving a major stumbling block. Chelsea, Manchester City, Tottenham and Inter Milan have also been linked with the playmaker. Clearly fears his mesmerising best is behind him are not putting off potential suitors. "He is a genius of a footballer," Hunter says. "He is wonderful to watch and makes a team lift its level by five or six notches when he is on form. "And, above all, he gives all of us who love football great pleasure and I miss that. "I hope he finds himself and the right club and becomes the real footballer that we love." Those are sentiments that will resonate with any admirer of a sport which, in Ronaldinho's case, so often justified being called the beautiful game. And while some at the Nou Camp may have quickly forgotten how he helped turn around the club's fortunes, some have not. "He could yet play in the last game and have the opportunity to say goodbye to the fans," said Rijkaard. "I have the hope that he can go on and show everyone the great player that he is. I am with him. I will never forget what he has done for this club."